indeed play a few games for Nairn County. 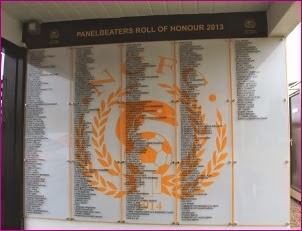 Kenny Urquhart, Dinger Bell, Johnny Bateson and Willie Irving to name the ones I know of. This was around 1962-63. In fact the names of all QO HLDRS, Cameron Highlanders and Seaforth Highlanders who played for Nairn County would be of interest to our Regimental Family if is was possible to list them. It would be appreciated if the name "Queen's Own Highlanders (Seaforth and Camerons) could be listed as a Panel Beater donation. On behalf of all former Battalion Footballers of the Queens Own Highlanders I wish Nairn County all the best for the forthcoming season." Bob Towns. Donald added: "Perhaps Nairn County fans of this era could assist Bob in his quest to get names of former Nairn County players from the regiment. In the meantime I have assured him it will give us great pleasure to acknowledge them on the Panel Beater board as requested. It is just another example of the history of the club and the role it has played in this community. We thank the ex-soldiers sincerely for think of the club at this special time it it's history"